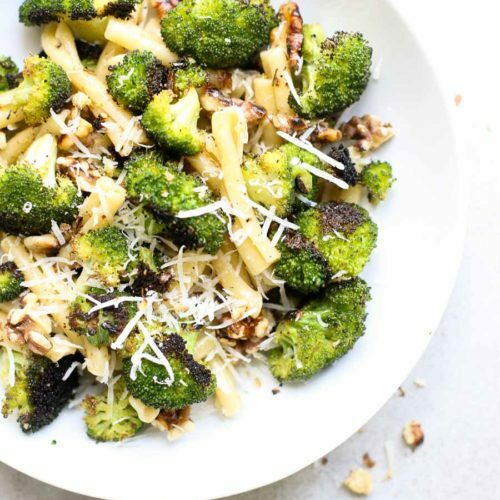 Perfectly caramelized broccoli, walnuts & nutty parmesan star in this easy Roasted Broccoli & Walnut vegetarian pasta dish that’s ready in 20 minutes and needs only 7 ingredients! This month’s Recipe Redux challenged us to create quick and easy meals with 7 ingredients or less. March is also National Nutrition Month and the theme is to savor the flavor of eating right. My favorite way to add flavor to vegetables is by roasting them. 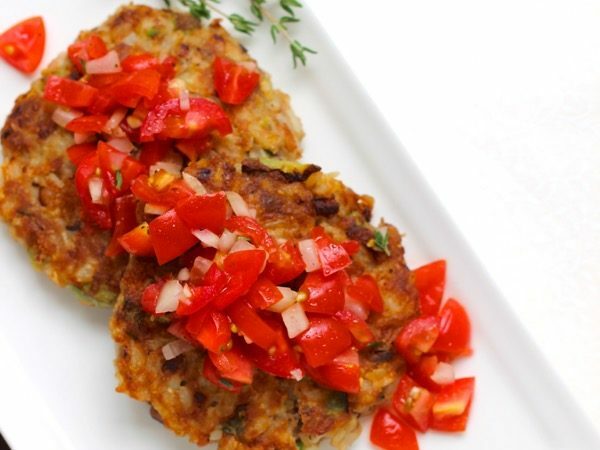 It’s one of the easiest ways to add incredible flavor without excessive fat or salt. It works for asparagus, Brussels sprouts, carrots, and other root vegetables, cauliflower and even green beans and cabbage. I’ve roasted them all! 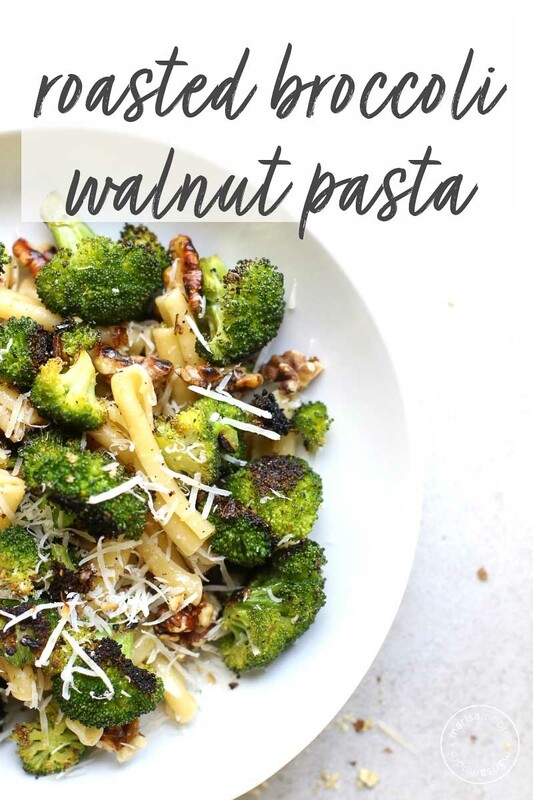 This Roasted Broccoli & Walnut Pasta recipe combines flavorful roasted broccoli with a weeknight meal staple – pasta. Now I could just eat the broccoli topped with walnuts and parmesan but the pasta makes it a meal. All you need is 20 minutes and 7 ingredients to get this meal on the table (not counting the water, salt, and pepper). Anyway. This recipe is flexible. I’m showing you a couple of different pasta shapes in this post. You can swap the pasta for quinoa or brown rice or try chickpea pasta which would be delicious here too. 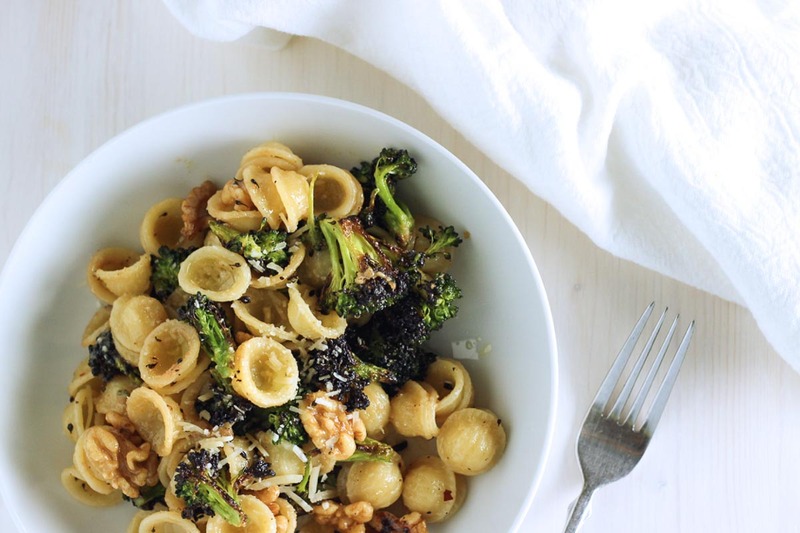 Swap the parmesan for nutritional yeast to make it vegan. Dig into the recipe below! And be sure to PIN it for later. 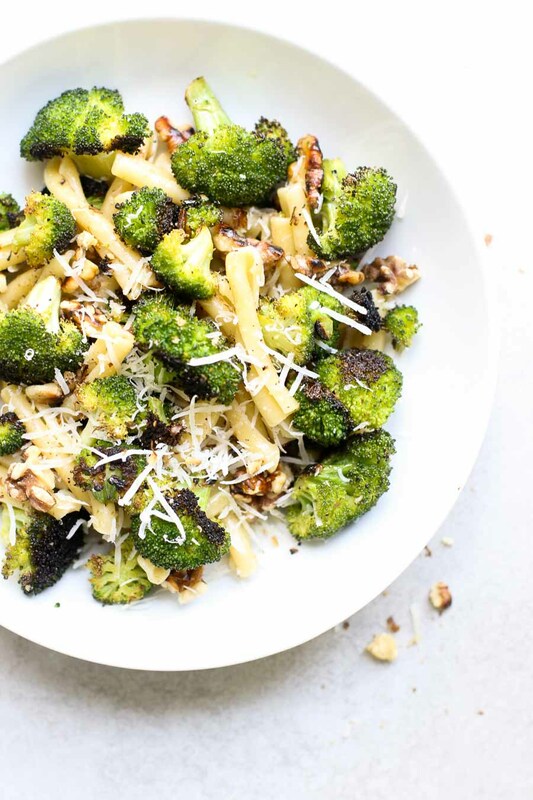 Perfectly caramelized broccoli, walnuts & nutty parmesan star in this easy Roasted Broccoli & Walnut vegetarian pasta dish that needs just 20 minutes and 7 ingredients from start to finish. Preheat the oven to 450°F. Spread the broccoli florets onto a sheet pan. Drizzle with 1 tablespoon of olive oil and sprinkle with salt and pepper to taste. Toss to coat. Roast broccoli 12-15 minutes, turning once. Prepare pasta according to the package - cooking to al dente. Reserve 1/2 cup pasta water. Drain. Heat the remaining olive oil over medium-high heat in a large saute pan. Add the garlic and red pepper flakes. Cook until fragrant, about 2 minutes. Reduce the heat to low. 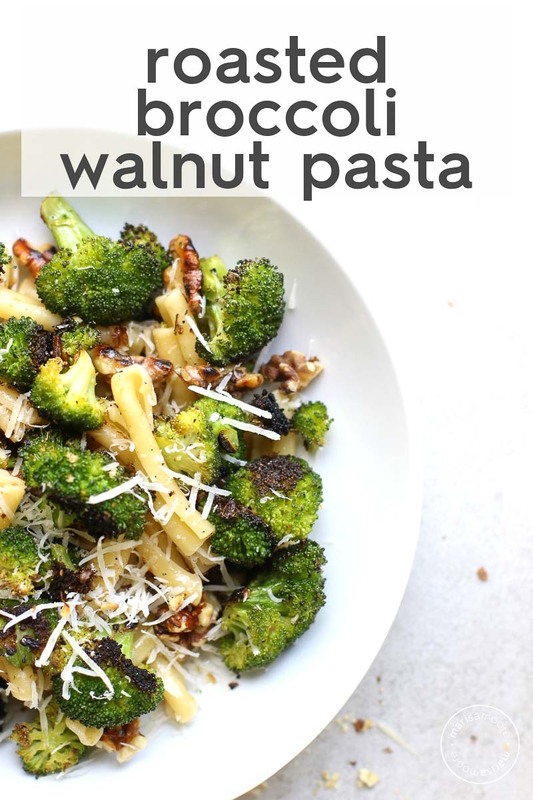 Add the hot pasta, broccoli and walnuts. Sprinkle with shredded parmesan. Add reserved pasta water starting with ¼ cup until desired sauciness is achieved. Toss to coat. Top with a bit more parmesan if desired. Serve. This looks incredible I love the added crunch and flavor the walnuts add :) Can't wait to try it! Roasted nuts add so much flavor, looking forward to trying this! This pasta recipe is totally up my alley! I could really enjoy a plate of this at dinner. Love how easy this is to make! Looks so delicious! Amazing flavors going on!